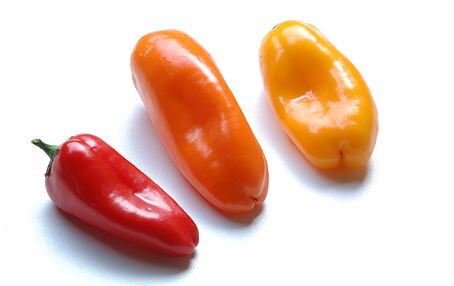 Baby capsicums were first developed in Japan so they could be used as single serves. They are about half the size of regular capsicums and have thinner skin. Their flesh is crisp and sweet. Like all capsicums, the baby versions are rich in vitamin C and beta-carotene, and are a source of niacin, folate and dietary fibre. Look for firm baby capsicums that have glossy bright-red skin. Store uncut in the crisper for up to a week.